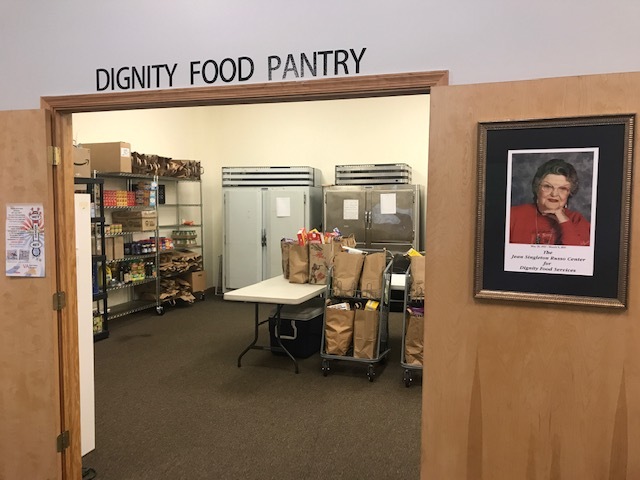 The Dignity Food Pantry operates as a mission of Discovery United Methodist Church. The Pantry offers canned, boxed and perishable foods to people in the community who may be in need. Please contact Jean Venner at jevenner@gmail.com or 360-4442 if you would like to volunteer or would like more information! This ministry was supported by a generous gift given to the glory of God and in memory of Jean Singleton Russo. Patrons are able to shop every 1st and 3rd Tuesday from 4:30-6:00 PM. The Pantry operates from private donations and is also a member of the Central Virginia Food Bank. Each client must fill out a registration form and provide a picture ID showing name and address as proof of residence. Clients receive a prepackaged bag of groceries per household. Church volunteers staff the pantry and offer personal help and Christian fellowship.